What is a PV GreenCard? The PV GreenCard is a comprehensive document that qualified installers provide to their clients on the completion of a project. The PV GreenCard contains details of the installation such as, what sort of PV modules and PV inverters were used, as well a checklist of all of the necessary installation steps that were completed. This document can be used as proof of compliance for insurance, finance, and regulatory purposes. What are the benefits of my solar system having a PV GreenCard certification? The most important aspect of the PV GreenCard is peace of mind that your Solar PV installation complies with industry and international best practice and installers meet minimum internationally bench-marked quality and safety standards. Why should I choose a PV GreenCard certified installer? International solar PV experts have worked together with SAPVIA for over a year to develop the PV GreenCard training outline and material in line with the national Solar PV Technician Qualification. Successful candidates are issued with an Occupational Certificate as a Solar Photovoltaic Service Technician. There are more than fifteen tertiary learning institutions around the country that are registered to provide this training. How do I find a certified PV GreenCard installer? You can access a database of qualified and verifiable solar PV installers in your area via the PV GreenCard website www.pvgreencard.co.za. Who can issue a PV GreenCard? PV GreenCards can only be issued by persons who are are registered in the PV GreenCard data base and passed the PV Assessment. A PV Installer who passed the PV Assessment together with a DoL registered electrician. In this case the electrician does not to have to participate in the PV assessment. How do I register to become a certified PV GreenCard installer? Installers successfully completing the assessment will receive a Certificate from maxx-solar academy and SAPVIA and will qualify to be part of a SAPVIA endorsed installer database which also forms a key entry point to become part of the PV GreenCard programme. The 2 day SAPVIA PV Installation Assessment includes a theoretical as well as a practical assessment where candidates are required to mount PV installations on a simulated roof environment. The purpose of this assessment is primarily to ascertain competency of installers and vet their abilities in order to gain access to the PV GreenCard quality programme. The registration form to become a PV GreenCard endorsed service provider can be accessed on the SAPVIA PV GreeCard page. It is important to note that your company will only be recognised as an endorsed service provider once you have enlisted suitably qualified PV installers. Installers should hold an electricians qualification/ wireman‘s license, be registered with the DoL and have undergone and successfully completed the Solar PV Installation Assessment. PV GreenCard endorsed service providers will form part of the SAPVIA PV GreenCard online database. Once registered you will be exposed to potential clients via the search engine on the PV GreenCard website. The PV GreenCard will also comfort the client in your sales communication. With the PV GreenCard you are able to prove that your installation will adhere to latest technical as well as safety standards and regulations. The PV GreenCard is a comprehensive documentation of your PV unit’s installation and used component. This is a voluntary industry quality declaration that encompasses the processes and procedures of the DoL’s Occupational Health and Safety Act (OHSA) amongst others. Where can I participate in the PV Assessment? 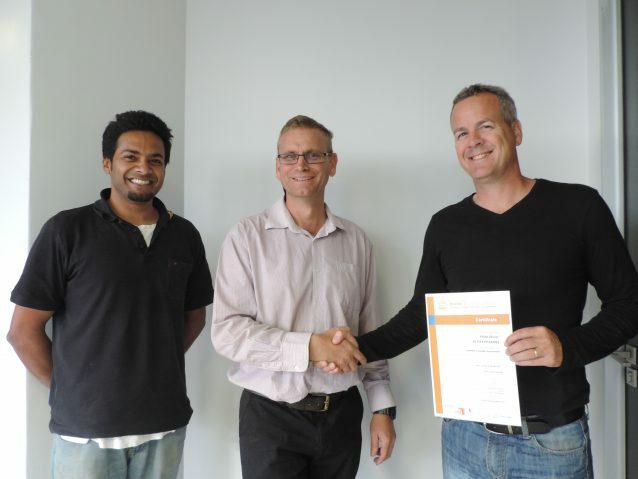 maxx-solar academy trainer Philip Olivier after the successful PV Assessment. He is now with his company Olivia Energy Solusions PTY Ltd. officially part of the PV GreenCard programme and one of the first certified PV GreenCard installers.